It's a crying shame when a surprisingly decent lunch ends with inattentive service. Ken & Cook, in the former Travertine space, has thrown open its doors for lunchtime eating. It's a small menu, limited in selection, which we don't mind, but not terribly inspiring. 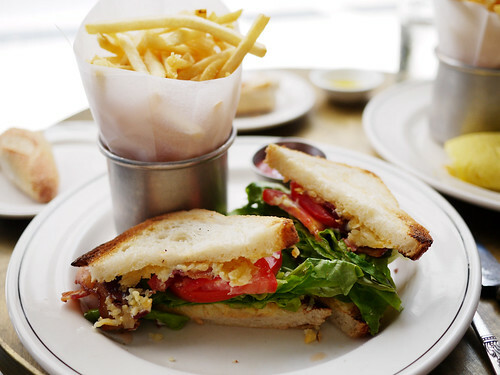 Still, the BLT was good and I love shoestring fries, really really love. The awning shaded us from the sun while the AC spun a cool breeze at our backs. Which would have been a perfect way to end the meal, instead of trying for way too long to get and pay for the check, leaving the lingering sensation of displeasure.